Back in May 2012 UNC-Chapel Hill’s Beat Making Lab presented one of it’s first musical projects, Tar Heel Tracks. Students enrolled in the Lab created all thirteen of the album’s instrumental tracks. It was their final project of the semester. Every beat on the album sampled a North Carolina artist. Less then one year later the Beat Making Lab has gone global! A bit of history, Beat Making Lab was founded by Apple Juice Kid (he’s produced for Wale, Azaleia Banks, Mos Def + others) and Dr. Mark Katz. The Lab began as a course offered at UNC-Chapel Hill. 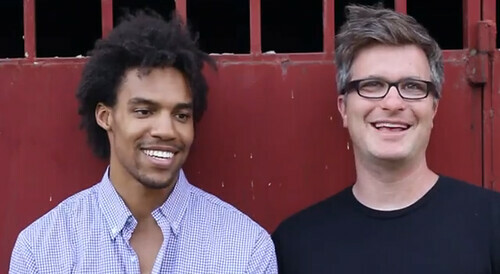 Pierce Freelon, lead emcee of hip hop/jazz band The Beast, became one of the professors for the class last year. The Beat Making Lab is now sponsored by PBS (! ), who is sending Pierce and Apple Juice Kid to community centers around the world, where they build music studios for youth to create their own music. and collaborated with a program, Yole!Africa. The PBS cameras went as well and captured some great footage of creating the lab, performances, and the youth’s response to their new production studios. Other countries where Beat Making Labs will be built are Portobelo, Panama; Dakar, Senegal; and Suva, Fiji. There will also be some in the United States. How very cool is it that a class to teach students to create their own beats began in North Carolina and is now international?! Watch footage from the Beat Making Lab’s visit to Congo below! You can also listen to and download "Cho Cho Cho", which is beat created by students in the Congo. This entry was posted in Education, Music, Performances, Travel, Video and tagged Apple Juice Kid, Beat Making Lab, Pierce Freelon. Bookmark the permalink.